Gor Mahia’s unbeaten in 2018 is now over. This after they went down 2-1 to Bandari at Mbaraki on Tuesday. Gor Mahia found themselves 2-0 down at halftime before Jacque Tuyisenge pulled one back. Heading into the tie, Gor boss Dylan Kerr fielded his strongest 11 having been given a scare in a 2-2 draw against Nakumatt over the weekend. The only difference was keeper SHabaan Odhoji who stepped in ahead of Boniface Oluoch who remains sidelined. Ernest Wendo returned for the first time since the CECAFA Kagame Cup where he limped off with a hamstring strain and he partnered Humphrey Mieno in midfield. K’Ogalo were shocked early with Guya heading the home side into the lead turning in a corner after 11 minutes, sending the home fans into frenzy while the green army of K’Ogalo was sent into stunned silence. But the league leaders kept pushing hoping they would get the steering wheel back with Godfrey Walusimbi and George Odhiambo making inroads on the left, but their industry didn’t provide much for the forwards led by Francis Mustafa. It was Bandari however who would get their party going, Congolese import Yema Mwana sending them 2-0 up after 35 minutes. The hosts should have added another one few minutes later when Darius Msagha broke off on the counter from the right beating Walusimbi to face Odhoji one on one, but he could not get the ball past the keeper with Mwana screaming for the ball in a better position. Gor came back with determined hearts in the second half, looking to salvage their invincibility with at least a point. Harun Shakava was the first to have a go at goal with a 65th minute stinging freekick from range but Bandari keeper Faruk Shikhalo proved equal to the task making a decent save. From another set piece, this time taken by Francis Kahata, Gor had a chance to get the scoring on but the effort curled beyond the wall but wide. Gor ultimately pulled one back through Jacques Tuyisenge in the 77th minute, but it was too little too late as Bandari managed to hold their own and get the three points. The hosts were reduced to 10 men for the final few minutes of the game when Fred Nkata was given his marching orders for a second yellow card. Coach Mwalala made a change bringing in Siraj Mohammed to fill in the void at left back. This leaves a bitter taste to the mouth. But to God be the glory. Too much square passes, negative possession and lack of aggressiveness to blame. Congrats to the team for making us believe, its normal to loose in football. Did mwalala know something we didn’t?he was super confident of beating Gor. Kudos to them,they have achieved what no other local team has managed this season! It happened with Barca, it happened with City. It was bound to happen. It should not happen with Rayon. Lets move on. Did not see what happened but congrats all the same. Hehehe ! I saw the line up- Odhoji on goal and you bet …..it was destined to be a ‘kichapo’ – mbili mbili kama kawaida. Congratulations to Mwalala, one of the best emerging coaches in Africa. As for Kogallo, let us all fans throng the Kisumu stadium this sunday to be officially crowned 2018 KPL champions ! Friends, I like the positive energy in the blog. The boys did their best in the second half. Shikalo did a lot of time wasting. I am very proud of our boys. Once again I will not blame Odhoji for the goals. Bandari were just lucky to score early and our undoing was that Blackberry, Mieno and Wendo were down. Bandari disorganized us with their thup thup balls into the sky after their fast goal and resorted to falling down even without contact in the second half. The attendance was amazing. One would think it was a weekend clash. I truly feel for K’Ogalo fans who will use ‘some specific buses to travel upcountry. Imagine a bus is infested with bed bugs and you have to travel some 500 km to Nairobi at night. A bed bug bite is painful enough, but it gets even more painful if they bite you when you are nursing a loss away to Bandari. Poleni jamaa. @BB, my very good friend, and with all due respect, when a team keeps a clean sheet, even if it is entirely as a result of the effort of the defence it is the goalkeeper who takes all the credit…the same parameter must apply when the team concedes!! The issue isn’t the confidence of the Bandari coach, but, the abnormal match scheduling for us. Now we pray for a fast recovery and no looking back. The pressure is too much. If we can feel the pressure, just imagine what the players are going through. Remaining positive even in defeat. That is called being a true fan. Bandari’s strategy against Gor worked for them however negative it was. The pressure on us is now over so those other teams won’t have a point to prove against us. Let’s mend the patches that the enemy crept through. You wanted Odhoji…..you have your wish. 3 games 4 goals conceded…..more to come. Odhoji will continue conceding. We will keep comparing notes. Odhogi cannot compare with Boni,and I don’t believe that coach Kerr is sidelining Boni bcos odhoji is better. If he things otherwise then somebody should tell him that Boni is the first keeper regardless of his errors. With the kind of pressure on the team we were bound to lose a match it’s very much hectic on the players now a match on friday then again on Sunday even the strongest can break but it’s good we are still ahead on Sunday the stadium will be full to capacity. George, why do you assume that everyone who blames Odhoji wants Oluoch? I for example have watched Odhoji for a very long time and I know what a poor keeper he is. My criticism of him is always backed by facts not baseless emotional outbursts. I don’t care who mans our posts as long as he does his job well. Do you know how many goals Odhoji has conceded in the few games he has played this season? Go check then we can have an objective argument. And nowhere in my posts have I ever said Oluoch should keep!!!! Welldone boys. We loose some but win most. I believe in God and our able team, we are 2018 SPL champions. Well done boys. Defeat is part of sports. Further, it is better to lose in the local league which is already sewn up than in any of the remaining knock out out competitions. Better to lose the battle than win the war. Congrats in order for our beloved Kogallo come rain or sunshine,thank God the pressure of unbeaten is now off our shoulders.Keep on fighting boys the most important thing is winning the league after all Man city and Barca also lost games but still lifted the league titles. Let’s live to fight another day,aluta continua. congrats team for making us proud week in week out…we are proud of you..relax refresh n prepare for Friday. we are fully behind you..praying and hoping for more wins. please pick yourselves up…better days are ahead of this our great team. by the way…this goalie thing…we should jus allow coach to dcide whom to field without fans pressure. when odhoji concedes we lose or draw..boni concedes but we win. fredrick was super the last time he llayed. 2-1 margin is acceptable in football and considering what the boys have gone through lately, it’s good, it’s ok men dust yourselves up and focus on the next game. One reason why I respect Musymo is his objectiveness and great understanding of the game. That he has his misgivings about Shaban and therefore does not read from the same script with most of us, does not mean that we should brand, cat call or demonize him. Kindly let us give room to divergent opinion. I choose to stand firmly with Odhoji because of his discipline and focus. This evening I took a few minutes for a face to face talk with each of the two GKs plus K14. I must report here that the two GKs showed amazing patience, humility and readiness to listen to advice. Personally I believe in discipline and I would rather have weak, but disciplined player than one who is so full of attitude, but scanty respect for authority. With Odhoji we are damned and damned without him. I stand by the coach because I believe he made an administrative decision regarding the goalkeeping department, but unfortunately it was not the magic fix he had hoped for. Issokay Issorait i thought waza would lock them out but osetimore. Morale boys we are still ahead with 2 games in hand so pick up the pieces going forward the schedule ahead is still punishing but we must endure. Be as it may i need Peter Odhiambo to also get a feel of the rotation policy and on that am putting our great sir Kerr on emphasis and he will play soon. Onge mosekethoree so we are still happy no cause for alarmvas long as we recover quickly and dont go on a downward spiral. BB answer me now owadwa..which tactics are this that had Captain Shakava striking omera? J’Asego weche iweyo ji jogweng’. Our unbeaten at some point was bound to end. Barca lost theirs with 2 games to end the league, Simba lost theirs on the dau theu were r3ceiving thw league trophy. Now we can concentrate on the on winning the CAF and the local shield. One reason why I have a lot of respect for Musymo is his objectiveness and great understanding of the game. That he has his misgivings about Shaban and therefore does not read from the same script with most of us, does not mean that we should brand, cat call or demonize him. Kindly let usallow room for divergent opinion. I choose to stand with Odhoji because I realize that we are damned if we don’t. His discipline and focus speaks for itself.After today’s match I took a few minutes to talk with each of the two GKs and K14 also. I must report here that the two GKs showed amazing patience, humility and readiness to listen to advice. Personally I value discipline and I would rather have an average but disciplined playerthan one who is full of attitude, but scanty regard for authority. With Odhoji we are damned if he is in goal and damned if he is not in goal. I sympathize with the coach and I firmly support his stand. I believe he made an administrative decision regarding the coaching department, but unfortunately it turned out not to be the magic fix that he had hoped for. As fan, mine is to stand firmly behind him and pray for a favourable turnaround soon. BB i saw sports news yesterday and i observed that pitch left alot to be desired. Bumpy like Nigerian ones in Ibadan. We should take our remaining home matches to Fortress Kisumu Pacho where little Hope Awaits Ye Who Enters There. Fans must also at this point uplift the team by thoroughly intimidating opponents peacefully into submission by electric game atmospheres to give the team relatively less laboured wins and ease the fatigue. While some try to conceal their mental ineptness by trying to justify their perpetual emotional outbursts of football being an emotional game hence intellect should be discarded , facts and commonsenseeventually always catches up and no amount of apologetic sugarcoating can masquerade a festering wound . Personally , I wouldnt care less who is between the sticks , all the matters is the performance , of the two , I know of Oluoch’s weakness and what he needs to change it , the problem is , is he willing to change , as for Odhonji , well , I would prefer Odhiambo that I knew before any time of the day or night . Finally , I wish to urge the boys to put this defeat behind them and stay focused on the bigger picture , even the biggest clubs on planet earth lose games , Barcelona’s unbeaten run last season was to a relegation bound team , so no tears , just lots of pride for a stellar performance this far . Gor Mahia problem of fatigue started from the mid season transfers where the chief broker CEO Aduda and confused EC together with Victor Kidiwa chairman of Gor Mahia Sacco decided to go for CECAFA without considering more investment in the squad by bringing on board at least three experienced players. The coach also seems to have low confidence on players like Guikan and Sammy Onyango. Why did the club went for CECAFA with a false notion of the club having a big squad? They could have sent the youth squad instead of the main team! Though in a game there must be a winner, loser and sharing of points, Gor Mahia shot themselves on the foot without acknowledging that football players are human beings not robots that at one point in time will need some rest and mental strength in order to perform. When the draw was made in August with 8 KPL games together with 2 CAF, the EC just accepted without protesting. This congested fixtures with active squad of about 20 players is now proving too much for our players to cope up and if we are not careful even two remaining CECAFA games are going to be too difficult to win with now fatigue manifesting itself on our players. Gor Mahia could have won the Bandari game by just taking flight to MOMBASA, playing the game and then flying back to NAIROBI for preparation for next games after feasting. EC and technical bench went to feast but ignored the important football logistics in MOMBASA being employed by Bandari. 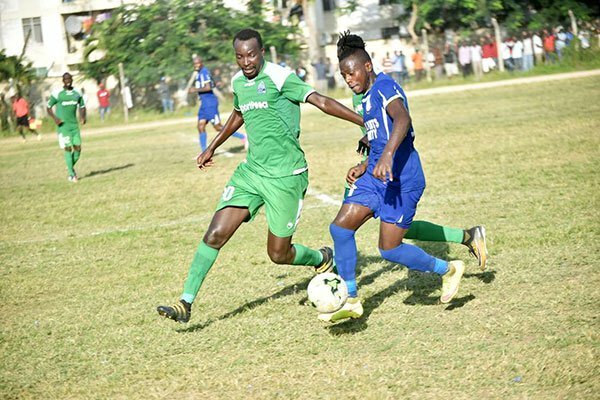 Gor Mahia got into the trap of Bandari and were boxed into “OVER-THE-BAR” phenomenon that could have been better off by avoiding eating anywhere in MOMBASA. Jolawi Obondo TM knows this very well but ignored to advise the club accordingly. This was the main reason Mwalala and Bandari were very confidence of breaking the unbeaten record. If you want to win in Mombasa carry your light snacks, play the game and feast later after the match. Please note that all the games Gor have won in Mombasa over Bandari, there have been no feastings before finishing the game first. Just a point of correction: I meant the coach had made an administrative decision regarding the goalkeeping department. Mwakio has stated, clearly what I feared to touch on. In hindsight, our boys should have flown to Mombasa yesterday. Perhaps the team is a victim of its own success so that every other fan want to extend some philanthropic gesture to appreciate the boys’ effort. I remember last year Blackberry toyed around with that same Bandari defence and scored a brace. In that match the team just flew to Mombasa the same day, played and flew back. The Bandari team that beat us yesterday was just ordinary and did not play anything extraordinary. It is noteworthy that the same Blackberry had a disappointing day yesterday. I watched a pre season game yesterday night between liverpool and Torino , and something interesting happened and which is a good lessons for we fans of K’galo to learn from and that is that bigger picture of the club should and must always overide our own private emotions . This liverpool goalkeeper , Loris karius , a villain in the champions league finals through blunders that would make our Oluoch look great , upon being introduced as a substitute , was met by applause , after which Karius later thanked the fans for the gesture . This should not be taken to mean that the fans have forgotten the howlers but rather that they have forgiven but going fwd it is his performance and only his performance that is going to define the relationship in the future , not vengeance , not prejudice and not feelings . Personally I will support who the guy who is with the players 24/7 I.e the coach , decides to field , thereafter I will have my say which will not be held back for fear of backlash from the emotional laden site police . To be honest I dint like the display,,,, gormahia is moving to another league y shuld they all simple clubs to beat them,,,, odhoji is becoming worser than oluoch btn dha sticks they once said is better to stay wid de satan dat u know rather than Angel dat u don’t know oluoch waz better ov thooo!!! According to Ker, “my keeper (Shaban Odhoji) has got to be sure when he comes out of the line; if he’s punching the ball, he needs to punch it completely”. Friends this is the same message I passed to Odhoji and his co-keeper and they were very receptive. The only other thing that I added is that they should punch the balls wide, away and not directly in front of goal. I am glad that Ker has seen the same weakness. This begs the question: didn’t Willis Ochieng’ the Goalkeepers’ Trainer see this or why does it allow it to happen in the first place? I have noted that @Musyno’s season 2 I told you so has not elicited the kind of dismissal and emotional outbursts like the season 1 did , this can only mean one thing , that the owners of emotions and vitroil are coming to terms with the consequencesof their mmisplaced emotional outburst and the lessons here that we should always contextualise the totality of an issue before we lay bare our ignorances . Facts and statics that you were hitherto referred to are now seamlessly and effortlessly coming out . Hahaha, Teddy that is very true. Everyone deserves some iota of respect, no matter how nonsensical or outlandish we may be viewing them. To our comrade bloggers who joined this wall recently, I, on behalf of the administrator and other bloggers take this opportunity to welcome you to this esteemed and respectable site. I want to assure you that you have made the right decision to join this company. In this site we share views objectively with the ultimate goal of contributing positively to the development of the Gor Mahia player as an individual and the club, The Mighty K’Ogalo as whole. The other collateral benefit is that we learn a lot from each other and become better people in the society. I must mention, as well, that we have been privileged to have a number of key officials in the Gor Mahia Executive Committee blogging here with us. One unwritten code in this site is to ensure our comments are unequivocally clear, to enhance effective communication. We therefore strive to put our views across in English or any other language in mature and comprehensive manner and in the process, we even enjoy toying around with the Queen’s language. Personally I value every other blogger’s comments because I believe there is something new that I can learn from that comment. Unfortunately, I get frustrated and lost, when I struggle to read a comment that contains words like wid, dat, de, thei, xo, iz, nt, deriver, nkt, btn, dha, thea4, among others. I believe the authors of such comments have the noble intention of passing some information across. My humble plea therefore, is that we should all just use the conventional, time-honoured, effective, universally understood written words when texting our comments. @midigocollins, are you serious? Being beaten by a team I the same league should not be a big issue if you are a keen football follower. A great team will be measured by how quick they recover from defeat. We also need to see the goalkeeping as a department and not as individuals. Anyone who follows the process of a league campaign will notice that all teams at some point will have their low ends/moments before the recover. We have the nakumatt draw and Bandari loss as our low end. We now need to pick the three wins against Posta, HomeBoyz and Chemelil and wrap the league with the matches against either Sofa or Ingwe. It will be that sweet. These are worrying times and the all concerned should move fast to mend any damages: ……..The club has since come out to defend the embattled Willis Ochieng, more so after he had a confrontation with Coach Dylan Kerr in Mombasa. Kerr and Ochieng allegedly exchanged blows at Mbaraki Stadium though Goal could not independently verify the main course of the conflict between the two members of the technical bench. Gor Mahia has denied allegations by a section of club fans that they could be involved in match-fixing scandal. Gor Mahia goalkeeping department has come under scrutiny even as the past threatens to catch up with Willis Ochieng, the team’s goalkeeper trainer. Ochieng’ was mentioned in a match-fixing scandal saga in 2011 after he allegedly received Sh6 million to slip in two goals in the Finish Football League in 2008. Ochieng, who was turning out for IFK Mariehamn, was exposed by the club manager Peter Mattson, who revealed that the custodian was suspected to have pocketed $70,500 (Sh6m) in bribes in connection with two away games the club lost in 2008. Gor Mahia’s goalkeeping department has come under question at the rate at which they concede ‘cheap goals’. Boniface Oluoch conceded two quick goals in a 3-2 victory against Yanga in the Caf Confederation Cup and Shaban Odhoji also made almost a similar blunder to allow Nakumatt come back into the game and force a 2-2 draw with the league leaders. But it was K’Ogalo’s lose to Bandari that left the ‘Green Army’ asking tough questions, especially the character and history of the goalkeeper trainer. The club has since come out to defend the embattled Ochieng, more so after he had a confrontation with Coach Dylan Kerr in Mombasa. “Our playing unit including the technical bench as currently constitute from defence, striking, goalkeeping to midfield is one of the best with high technical expertise geared towards delivering the best-desired results,” said Gor Mahia Secretary General Ben Omondi in a statement obtained by Goal . Aiiish! awuoro…why was Mwalala so confident? Jasego…do the needful. @Jasego, I agree with you. Our goal-keeping coach should be shown the door for failure to train our goal keepers on basics of goal keeping with set pieces as the mistakes being made are primary school kids mistakes. How are goal keepers being scored on set pieces? Goal-keeping coach has a thousand and one questions to answer. We can not be dropping the ball to opponents strikers to score! @BB , while I appreciate your concern at the mode of communication e.g the use of such words like xo , deriver and Odhigi ( surely what are those) , I am cognisant of the fact that K’galo is a mass movement , and just like any other mass movement , there will be people who know , people who think they know , people who dont know that they dont know , people who know too much of very little , people who come along because doing so is fashionable and gives them a measure of belonging etc ,frustrating at times as it may be , it is a fact we all must accept to live with though not necessarily to accept and as such there will be the die hard stone thrower , a die hard and unapologetic joliero , a sworn funeral terrorist proudly adorning a K’galo t-shirt , a pastor , an engineer , a politician and even a lawyer etc , this is a global football phenomeno and as such you will occasionally come across a wannabee who cant wrap it around his head that Gor is capable of losing to Bandari , when just a lazy global glance will show him or her Man U losing to West Brom , Barcelona losing their unbeaten record to a relagation bound team . Personally , apart from the inevitable irritation , I have come to accept that not everybody is blessed with a capacity to contextualise. Hehehe, “a sworn funeral terrorist”! Teddy Sofaset you are amazing. I blame this on Oguda and Mwendwa, how can the boys play competitively after every 3 days for a whole month, it’s just not possible.